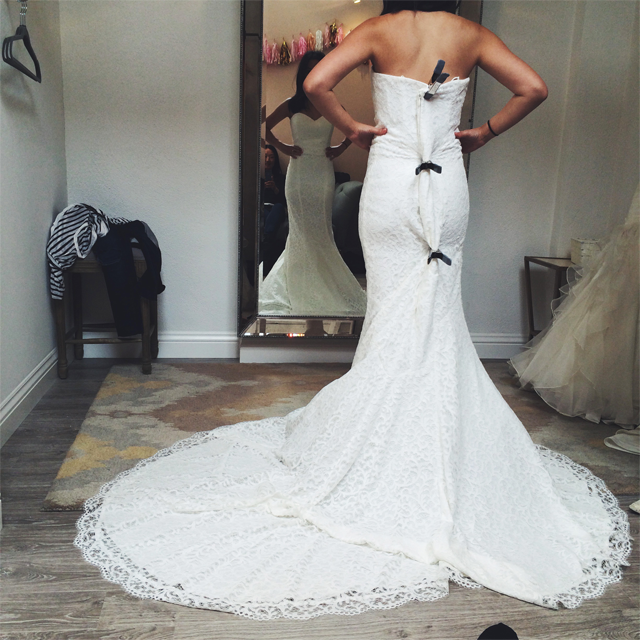 Finding your wedding dress. It’s probably one of the most exciting parts about planning your wedding … well, at least I thought so. 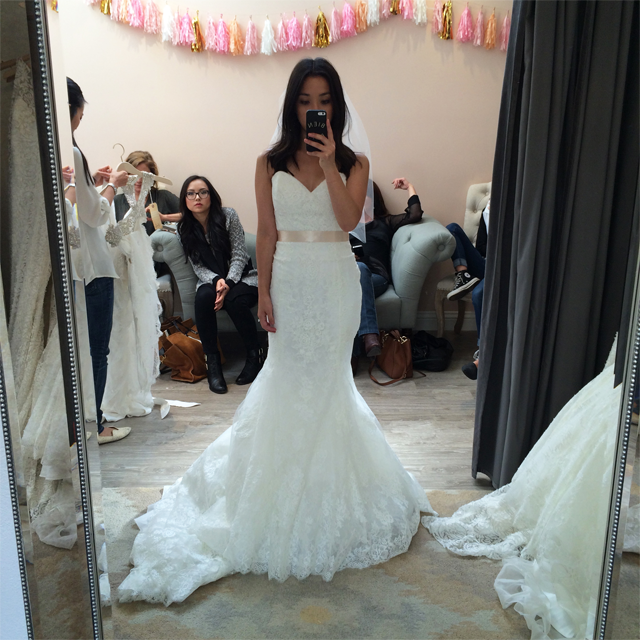 I’m not one to typically like a crowd in the dressing room, but I knew I had to make the search for my wedding dress a day with family and friends, afterall, you only do it once. Since I had family in town for the day, I wanted to get in as many appointments as possible. I booked back to back to back appointments in San Francisco and while it was exhausting, it was so much fun and memorable. 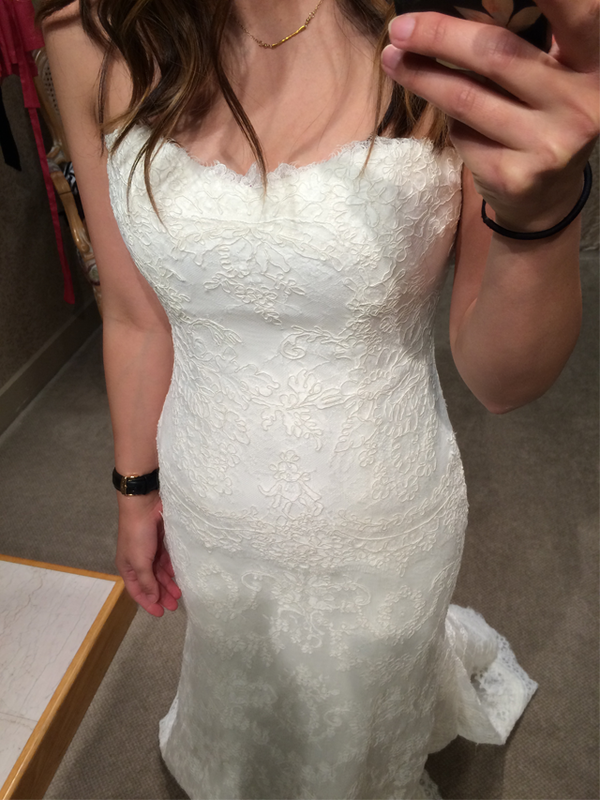 When I tried on my first dress, I couldn’t hold back tears. For a girl who never grew up thinking about a wedding, it was all so surreal to see myself in a huge white gown. After the initial shock, I was ready to roll. I tried on about 15 dresses that day and then 8-10 more before I made my final decision. Going into the day I had an idea of what I was looking for. I didn’t want anything overly feminine or overwhelming on my petite frame. Even though I had a vision in my mind about ‘the dress’, I played nice and tried on everyone else’s favorites. Most of those did not get photographed ;). I also wanted to make sure I didn’t fall in love with a another silhouette (that whole, it looks better on than on the hanger, thing). 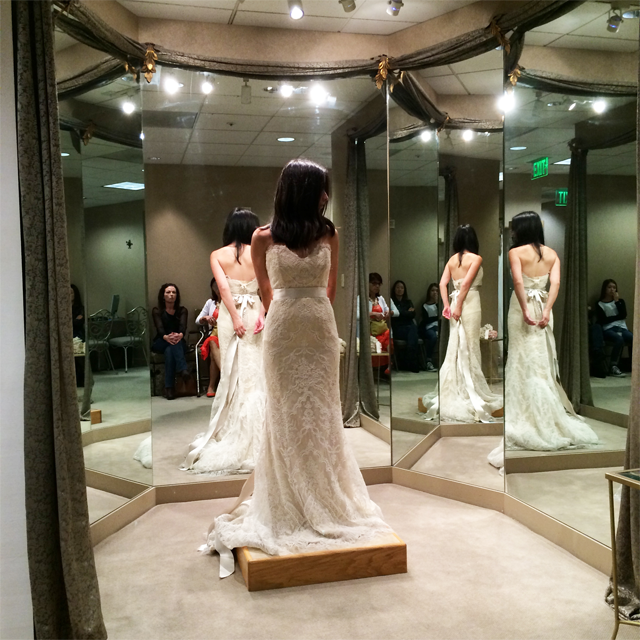 Once we made it to our third location, Bridal Galleria, I started to feel like we were getting warm. 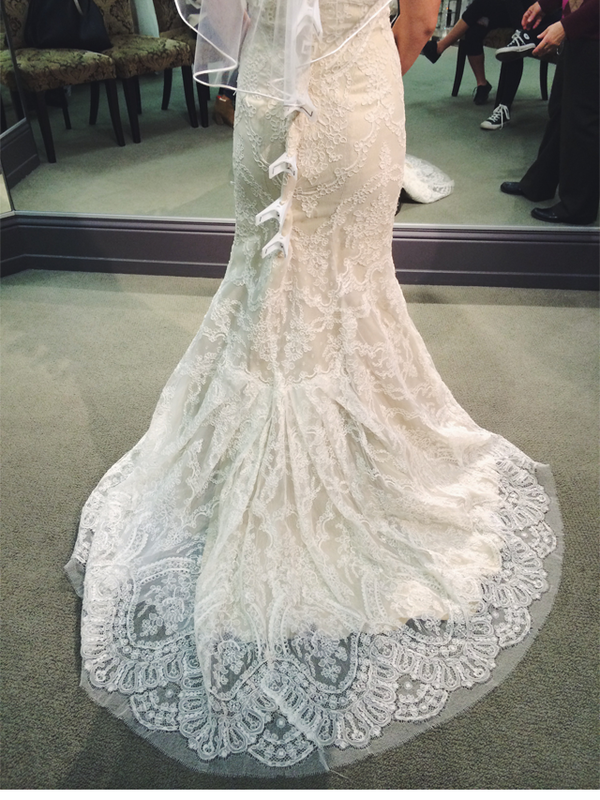 I tried on the BLISS Monique Lhuillier Embroidered Lace Trumpet Dress and fell in love. 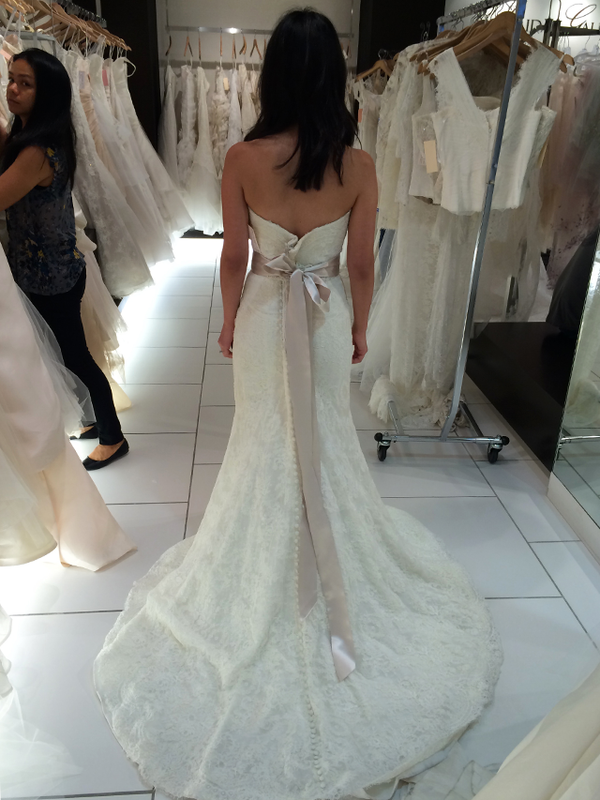 The way it fit, the exact silhouette I had envisioned, topped off with a gorgeous champagne silk belt. I tried this dress on a couple of times in the same day and walked around the store, I couldn’t really take it off… I left thinking this could definitely be the one. 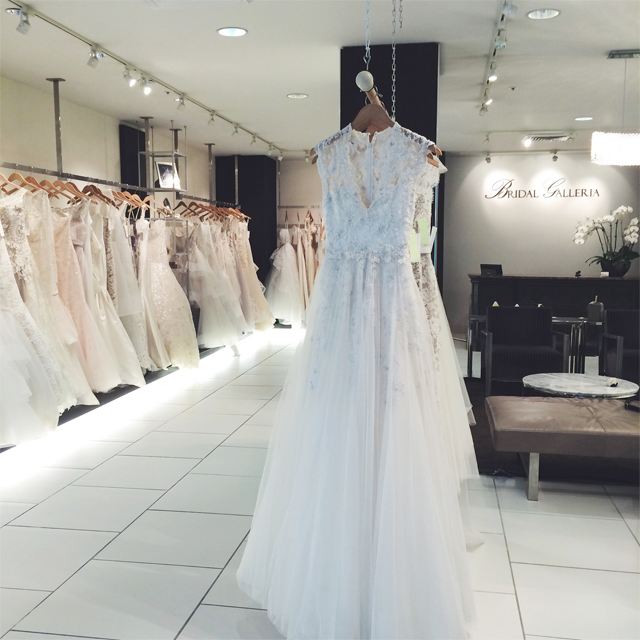 The week following my first set of appointments I started researching Monique Lhuillier’s Bliss Collection. 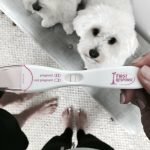 For those of you who don’t know (which was myself at the time), Monique Lhuillier offers a more affordable collection of wedding dresses that she’s deemed her Bliss Collection. Prices range from $2000-$5000. After perusing online I realized she had more dresses similar to the one I fell in love with. 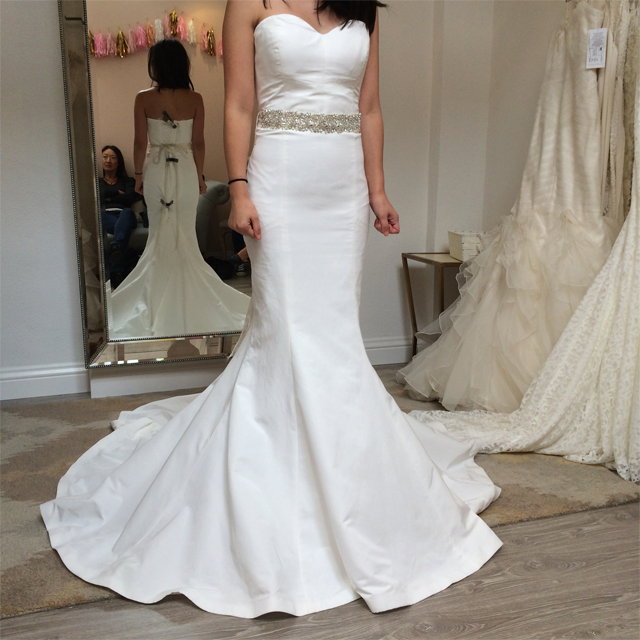 I called Bridal Galleria to see if they had more dresses from the Bliss Collection and booked another appointment (Bridal Galleria is the only Bridal boutique in the area that carries this collection). 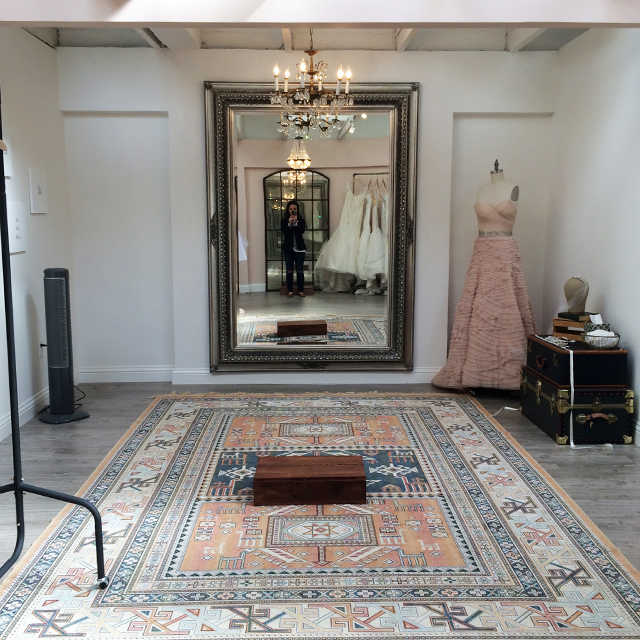 I tried on 2 other Bliss Collection dresses plus the original dress. This is where the hard part came in. They were all so similar in silhouette and style, the only difference was the lace pattern. When you don’t know anything about lace, things can get difficult. The good news, I narrowed my search down to 2 dresses. The bad news, I didn’t know which one to choose. Ultimately, it came down to which lace pattern I liked the best. I ended up going with the BLISS Monique Lhuillier Strapless Lace Wedding Dress with Beaded Waist. 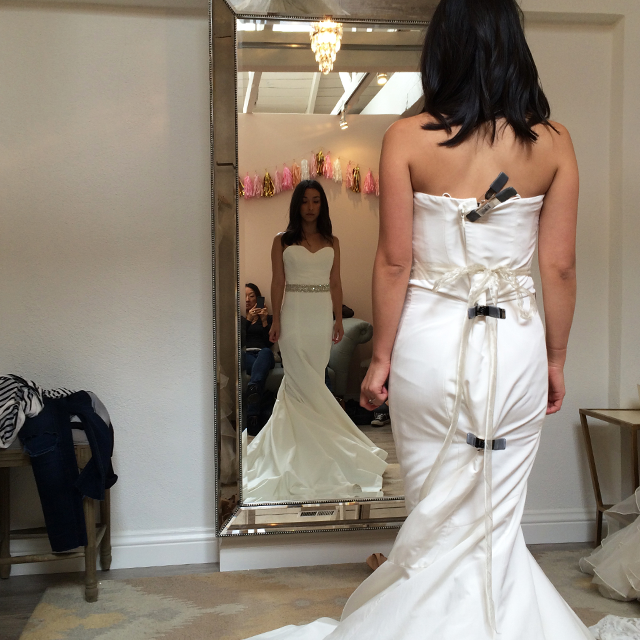 We removed the belt and added the champagne silk sash. We also removed all the tulle inside the skirt for a more natural look and added a modified sweetheart neckline. 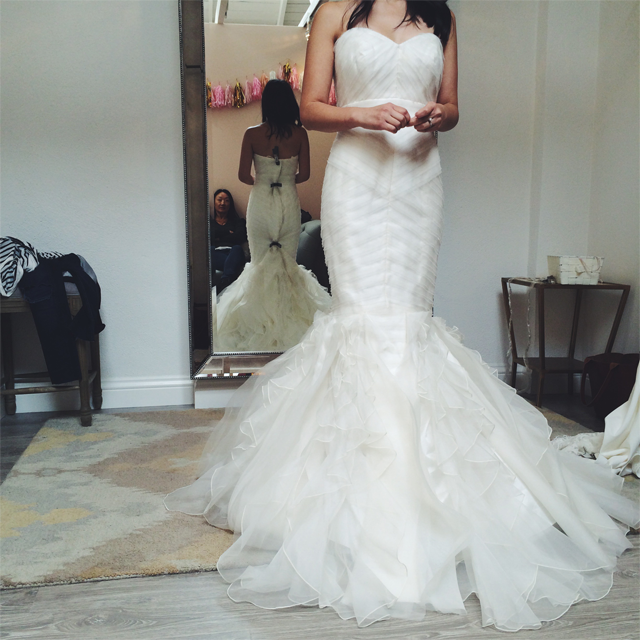 When it was all said and done, I ended up picking a dress that I originally dreamed of wearing. Bella Bridesmaids – very few wedding dresses, they’re more known for their bridesmaid dresses (an obvious observation by the name of the store). 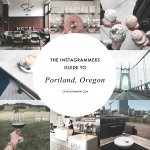 If you’re looking for inspiration for you bridal party, this place is amazing. So many options in so many colors! Lovely Bride – This place is absolutely adorable! They have dresses in a good price range and they’re known for their more whimsical, indie, non-traditional dresses. 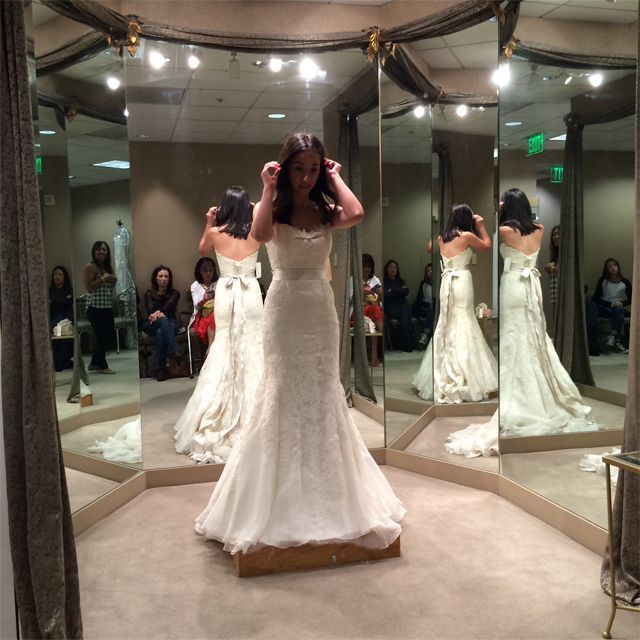 Bridal Galleria – I couldn’t be happier with my experience with Bridal Galleria. They had the exact dresses I was looking for and in a great price range. The staff is awesome and everyone is really helpful. If you plan on making an appointment here (which I recommend) ask for Haily, she’s extremely knowledgeable and just awesome! 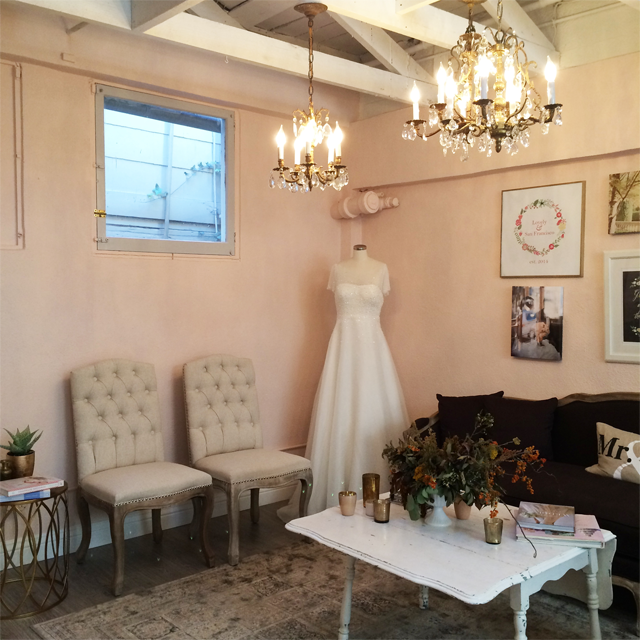 Amy Kuschel – Booked an appointment here, but ended up canceling because I was exhausted. Trudy’s Brides – This place is a mad house. While it was never my first choice, it’s pretty well known in our area, so I had to stop in. To me, it seemed like everything was cheaply made. And knowing that it’s known for it’s affordable gowns, I was pretty shocked, the dressed I tried on were the same price as the ones I tried on at the other stores. – Bring a strapless bra, but expect to go bra-less in some dresses. 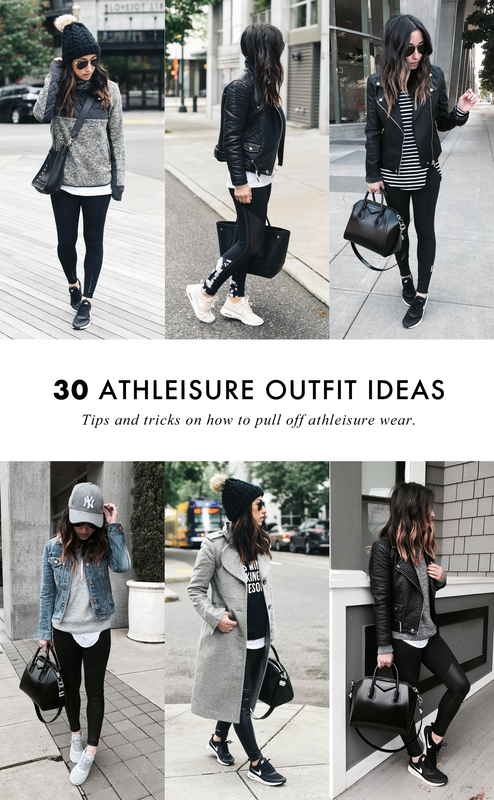 – Wear clothes you can easily get in and out of. – Pack snacks and water (it’s exhausting). – Break for lunch. You get tired, cranky, and think about your entourage. – If you do go with a group of friends/family members be prepared for lots of opinions. – Don’t let anyone persuade you on what you like. 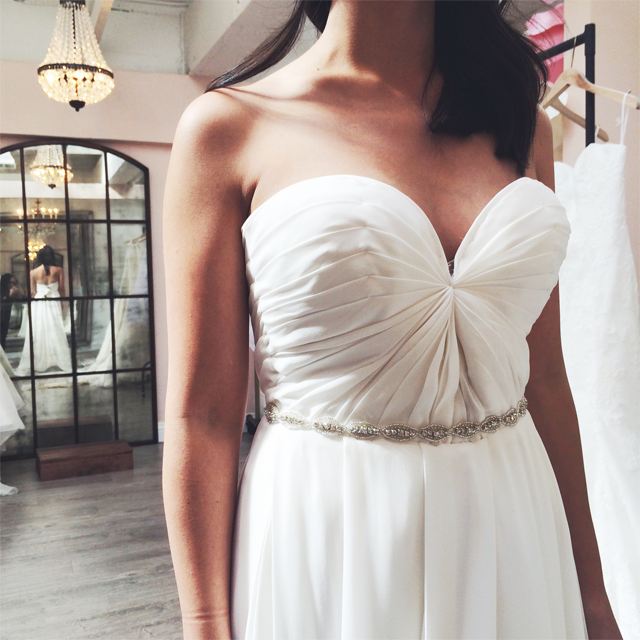 Don’t let anyone choose your dress for you. – Try to book your appointments 30-45 mins apart. Some appointments run late and think about the distance between each location. – Every place I booked had restrictions on the amount of people who you could bring in. I exceeded the amount every time, but since we went on a Friday morning, they didn’t mind because it wasn’t very busy. – Take photos – A few of the dresses I thought I loved on me while in the moment, I realized were so not me after looking back at photos. – Have fun and enjoy it! 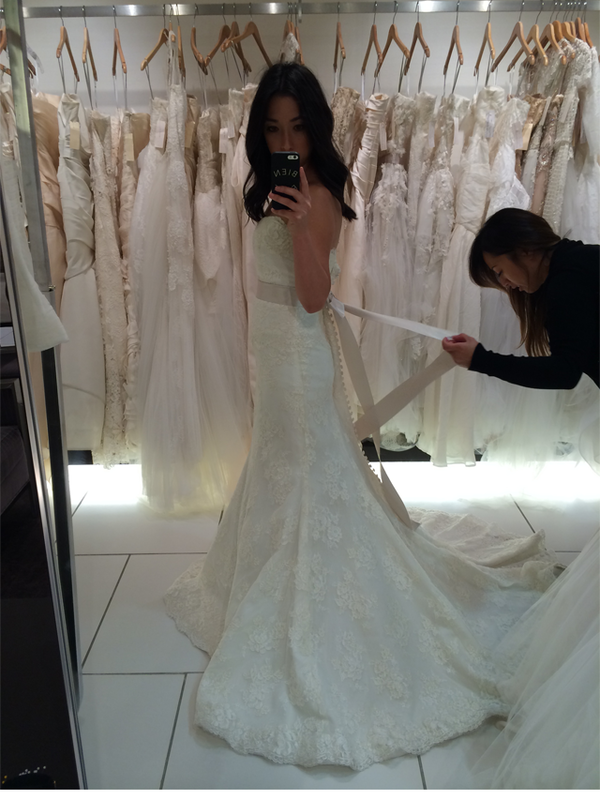 I got my dress at Bridal Galleria too! I decided on a lace Marissa dress. 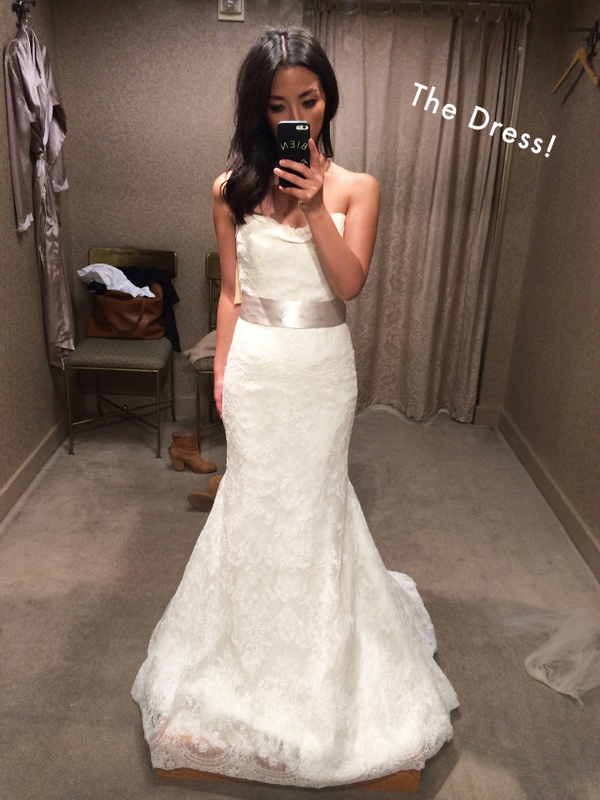 Thanks for sharing your dress search shopping experience! I went to some of these places too, and many more! I really enjoyed my experience at Amy Kucshel and would recommend it. Sarah Seven was fun because they gave us champagne and we had the whole place to ourselves. Places I didn’t really like were Trish Lee and Gin Wang. They were too pushy and didn’t seem to understand my feedback. Ultimately I decided to get a custom dress made because it was only slightly more and I loved that no one else would have it! I cannot wait to see how it turns out! 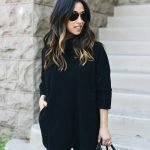 Could you tell me what brand you’re wearing in the third photo down from the Nicole Miller Dakota dress? It’s the one that has the subtle cross hatch pattern on the bodice? Thank you! I actually don’t remember the designer (sorry! ).